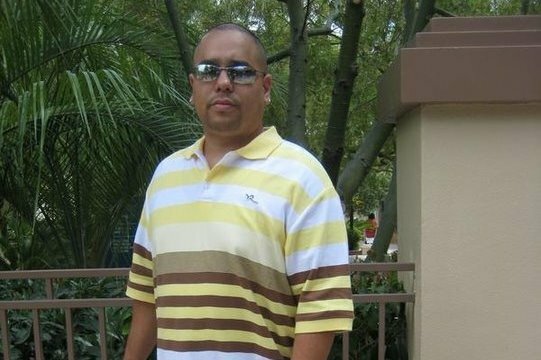 Andres De La Cruz III, 41 years old, passed away peacefully alongside his family at Kaiser Modesto on June 13, 2018 as a result of complications due to multiple myeloma. He was born on October 6, 1976 in San Francisco, the son of Andres De La Cruz Jr. and Maria Santiago. He lived in San Francisco until the 6th grade, later moved to the East Bay and eventually settled in Tracy. He graduated from San Lorenzo High School in 1994 and held various jobs – most recently at Washington Mutual Bank. Andres attended St. Bernards Catholic Church in Tracy. Andres is survived by his parents Andres De La Cruz Jr. and Maria Santiago; his sister Marisol De La Cruz-Velazquez (his Olive Oyl) and brothers Aristel De La Cruz, Anthony De La Cruz and Christian Molina. He is also survived by his wife Yolanda De La Cruz (his Diabla); daughters Alexis Cardera (his Shorty), Xevelia De La Cruz (his Big Head) and Andrea De La Cruz (his Kuki); nephews Izy (his Godson) and Isaiah Velazquez (his Knucklehead), several aunts, uncles and cousins. Andres loved to have a good time with friends and family all while giving everyone a hard time. He loved sports: Baseball, Football, Basketball, Boxing and Soccer. His favorite teams were: SF Giants, SF 49ers, LA Lakers, Woman’s International USA Soccer Team, and his favorite boxers were: Felix “Tito” Trinidad and Miguel Cotto. Most will miss his “polite” sports debates . He was an amazing father, husband, son, brother, uncle and friend. He protected his daughters, sister and his friend’s daughters as his own. He gave the kids great advice on the importance of “hard work and dedication” and life in general. He loved to joke around with them. He loved to cook and was amazing at it- I bet we can all agree! A celebration of life is being held on Tuesday, June 19, 2018 at Fry Memorial Chapel at 550 S. Central Avenue, Tracy, CA 95376. Visitation will be from 9:00 a.m. to 5:00 p.m. with Prayer Service from 3:00 p.m. to 4:00 p.m. Dinner to follow at Israel and Mari’s Home. For those who would like to help the family, please do so via GoFundMe. Thank you all for your thoughts and prayers during this difficult time.